You can set the size and overflow of a report object to control the overflow at run time. Fixed and Flowing overflow options are available through the Properties window. Fixed. The report is confined to the dimensions of its (Design View) bounding rectangle at run time, and continues to output on multiple pages within the same fixed dimensions until all of the data is shown. Flowing. The report output begins at the top of the page and fills the page (and subsequent pages) with the report results until the data is complete. Flow margins are available to define the starting and stopping point on each page. Flow margins enable reports to automatically fill an area of the page while enabling other objects, such as repeating images and text (headers and footers), to be shown and not overlapped by the flowing report. Note: These options only apply to report objects. There are no size and overflow properties for graphs, images, text, or lines. The following image is the report output with fixed overflow. 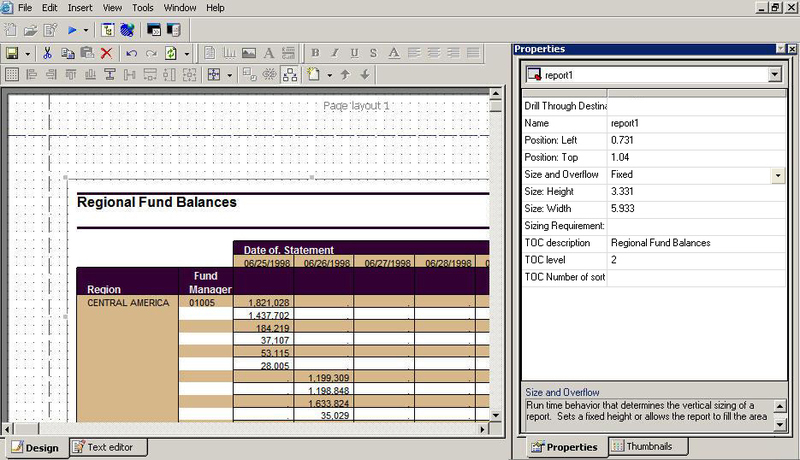 The PDF Pages view shows how the report output maintains the size and position of the report object in Design View. The following image is the report output with flowing overflow. The PDF Pages view shows how the report fills the page, based on the flow margins, at run time.